Photo thanks to Janos Schmidt. Calm. That’s how I would describe my experience in Abu Dhabi. It was my first time in the Middle East, a surreal place. The buildings were magnificent, the water was clear but super salty, and the day we left, it was so hot there was a heat haze. Hummus, baba ghanoush, and dates were plentiful and delish. Alcohol, on the other hand, was not common. In fact, our hotel was a “dry” hotel. As race day approached, I wasn’t as nervous as I’ve been in the past. 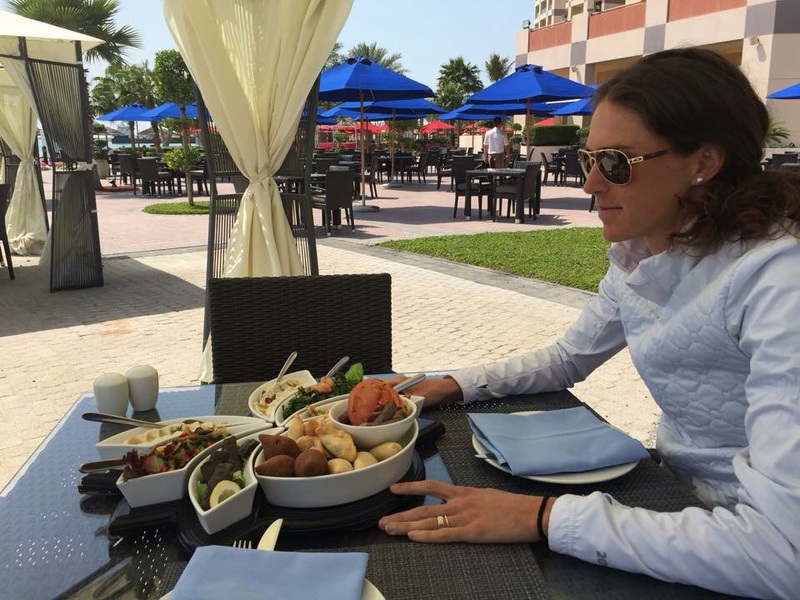 I was relieved to be relaxed; it was a nice alternative to my last WTS (Edmonton 2014). During my week in Abu Dhabi I was invited to a local’s house for dinner. Being able to get out of the hotel and eat a home cooked meal when I’m at a race is refreshing. I was able to catch up with an old friend Omar Nour (who I hadn’t seen in over two years) and a few others from the triathlon scene. Our hosts, Marc and Mary Carol, were incredibly generous. They welcomed us with wine, water, cheese, and nuts, followed by a healthy dinner of chicken, fish, salads, quinoa, and desserts. I left full, happy, and at peace. Maybe this is the reason I was so calm leading into the race. 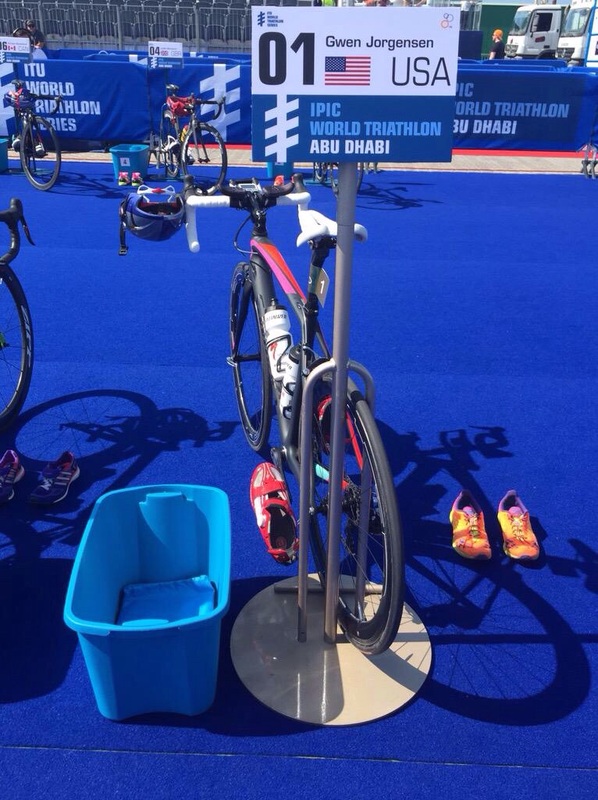 The Abu Dhabi WTS sprint distance triathlon started at 3:06pm for the women. It was a beautiful day for a triathlon and I was pleasantly surprised with the amount of triathlon fans there to cheer us on. 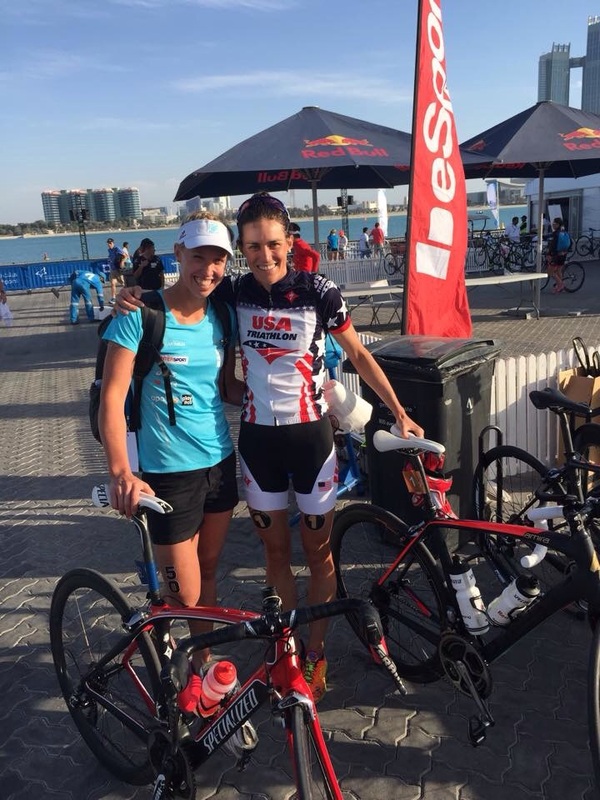 This was the first ITU race Abu Dhabi hosted, and they knocked it out of the park. Everything was on time, ready, and safe. The swim was a beach start where we ran into the calm, salty, buoyant water. As I approached the first buoy, I wasn’t in the top five and paid the price. It was brutal as I struggled to stay above water around the buoys. I came out of the water in the middle of the field and had some work to do. I never panicked. I remained in the moment and focused on the task at handing: getting to the finish line as quick as possible. Over the course of the 20km bike ride, I was in the second chase pack. Before I knew it, I was in T2 putting on my running shoes. I exited transition on a mission to test myself on the run. By the end of the first (of two) laps, I saw the current leader: Flora Duffy. I was shocked I was making up so much time on the run and before I knew it I was in the lead. As I crossed the finished line and looked over my shoulder, I couldn’t have been happier to see USA teammate Katie (Hursey) Zaferes cross the line in second for her first ever WTS podium. Team USA had five women in the top ten! I’m proud of our country and proud to be a part of triathlon history with the other USA women. I’m now back in Wollongong. The main goal of the year is the Rio test event in August. Thank you to Coach Jamie, Patrick, Heather, USAT, my family, and my sponsors. It’s going to be a challenging season and there is still a lot of work to do. I’m excited and ready. Up next is round two of the WTS in Auckland, NZ on Sunday, March 29th. Thank you to everyone who helped to get me across the finish line in first. Picture thanks to Janos Schmidt. Two Island House athletes post race: Lisa Norden and me. A ride in Abu Dhabi before the race. A run in Abu Dhabi. Hummus, hummus, hummus. Where to start? My wonderful grandma watching me race all the way back in WI!